TB 58.0b3 is inserting restrictive (add txt) pop-up when I try to insert an image. How can I disable this as my email contacts don't have txt based email clients? I see there is an update for 59.0 beta 1. Does this version have the same annoying pop-up. It's hard to believe that in 2018 that anyone would be using a txt based only email. Moving to Thunderbird Builds as 58.0b3 is a pre-release beta version. So you are composing a message in HTML, use Insert > Image, get the Image Properties window, and don't see the "Don't use alternate text" option? Yes, the Image Properties window is still there in 59.0b1. What do they see if you don't add text and the image doesn't appear, or they view messages in plain text? My question is: How can I disable the pop up that requires me to use alternate txt? I know I'm using a beta version. I don't want to add alternative txt. The std ver works fine for me & I don't want to go thru any xtra steps. If I have to go back to a NON Beta version, how can I accomplish this without loosing my email contacts? Last edited by LIMPET235 on February 17th, 2018, 8:47 am, edited 1 time in total. Reason: Removed the coloured text to make it more readable. Has the image posting changed? I was able to post an image from my HD as Ive been doing for a long time in this & other forums. Tried using Img above to no avail. How does one post an image? I would like to post an image of the pop-up of my question hoping it would clarify my situation, as I'm receiving ?answer's? to everything but the question I asked. Also I have been checking "Notify me when a reply is posted" but haven't recd any email notifications. Has that function been eliminated, as it's on the bottom of the post page? Do you have "Notify me upon replies by default:" selected under the User Control Panel->Board Preferences->Edit Posting Defaults? After much searching I was able to find user control panel, very small print, and enabled send email as posted. Please let me know if it works when posted on the actual forum? AFAIK, no-one will log in to the Drop Box acct. Another image for you to check out by using a little "Marketing Imagination" along with "creating dots" to make it easier for everyone to find: User Control Panel. It works for me. The radio button id="noAltTextRadio" selected state is stored in the xulstore.json file. Not anything new. 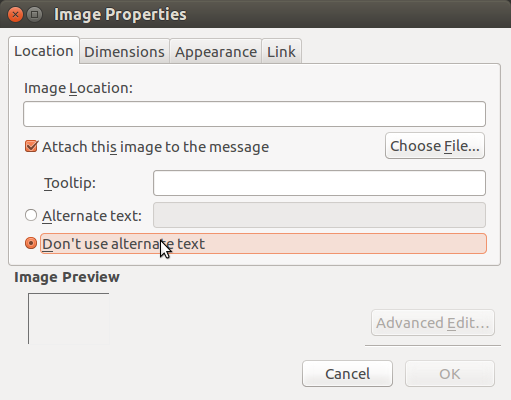 This is a screenshot of Image Properties in Thunderbird 17.0.9. It is also in the current version 52.6.0.
morat wrote: The radio button id="noAltTextRadio" selected state is stored in the xulstore.json file. .. which means the setting is carried over to subsequent sessions. FYI: Dropbox is mentioned in Mozilla's manual as was suggested in one of the current posters. If you get a popup asking you to join drop box, click the X in the upper rt corner. Popup will collapse & linked image appears. Below are 2 links to images in Dropbox's Public folder. I had my atty check the links & they file. Popup link: https://www.dropbox.com/s/d180x4v9m1kx0zz/tb%20image%20popup2.jpg?dl=0 you guys can forget this, as I'm just putting any char in it & going ahead. WaltS48 posted a possible solution I'm going to try. You will still get the popup when you use Insert Image. Found this in another Thunderbird support forum. Thank you for describing what is in the picture. When people post such things, please give a description of the photos. Myself and other visually impaired subscribers to the list will appreciate such explanations.